For my second assignment Mistress has demanded that I write up some of my travels and experiences. Thinking about it, the only way I can do this is in chronological order. After all, that is the only order I know unless Mistress clicks her fingers. I’m sure that will work because as time has gone by, I have gradually got farther and farther out of Manchester. 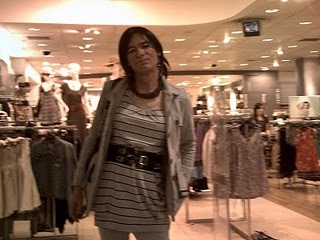 So first a picture of me in the Arndale shopping centre; the biggest in Manchester. Mistress has asked me to introduce myself. This may take time as there is quite a lot to tell but I will try to keep it fun. I love fun you see, it is the one consistent theme of my new life. The farther and deeper I get into Tricia’s head the more fun I have. It can be hard work sometimes though. I’ll begin though with the boring bit. I was born 53 years ago as a male in a hospital near Wembley Station. That makes me British and, trust me, I’m very British. I had a normal education, enjoyed university, went into IT and had three children (who are now grown up and I love dearly). I did all this by denying Tricia’s existence. I knew she was in me but was far too scared to let her out, or let anybody know about her existence. That was until my Father died. Through no fault of his I seemed more free and became determined to get Tricia out. And girl, have I done that!